The crowds are picking up at the PIB. Picks so far: Double Mountain Devil's Kriek, Mikkeller Bourbon Black Hole and Chipotle Porter, 21st Amendment Double Trouble IIPA, Flyers Kentucky Uberwine. The vibe is great. Lots of great beers I didn't mention. Bring your own drinking water. The servers will rinse your glass if you want, but there's no free drinking water ($1/bottle). The Cantillon Kriek is 6 tickets, not 3. 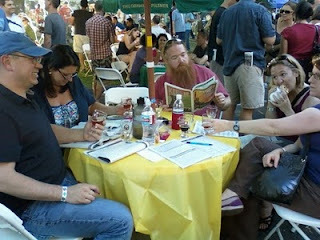 These beers are in the program, but not at the fest: Rogue Chatoe OREgasmic, Rogue John John Juniper, Deschutes Black Butte XXII, Firestone Walker Double Jack, Dieu du Ciel Rigor Mortis Abt, Mikkeller Beer Geek Breakfast Bacon, Haandbryggeriet Odin's Tipple. Beers to avoid: Epic Mayhem (OK, but not 4-ticket good), Trois Mousquetaires Imperial Weizen (nasty), Sierra Nevada Southern Hemisphere Harvest (this is not a fresh-hop beer). There may have been other missing beers, but those are the ones I noticed. Maybe the Rogue choices have arrived by now. As for the other ones, there was usually a very decent replacement. The Dieu du Ciel Aphrodite (replacing Rigor Mortis) was nice and chocolaty; the Mikkeller Chipotle Porter (replacing Breakfast Bacon) was a home run if you like hot peppers and dark beer. Anyway, the weather is beautiful, have a great time! I didn't mention the beers I tried and was unhappy with, but the Oak Aged Chocolate Yeti was so bad I dumped it. WAY too much oak. Tannic bomb. Yuck. The line was six miles long, though, so this view was obviously not mainstream.